This article is about Erasmus Darwin, who lived 1731–1802. 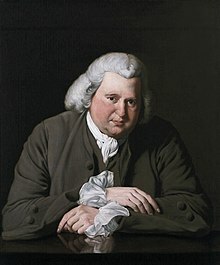 For his descendants with the same name, see Erasmus Darwin (disambiguation). Erasmus Darwin (12 December 1731 – 18 April 1802) was an English physician. One of the key thinkers of the Midlands Enlightenment, he was also a natural philosopher, physiologist, slave-trade abolitionist, inventor and poet. His poems included much natural history, including a statement of evolution and the relatedness of all forms of life. He was a member of the Darwin–Wedgwood family, which includes his grandsons Charles Darwin and Francis Galton. Darwin was a founding member of the Lunar Society of Birmingham, a discussion group of pioneering industrialists and natural philosophers. He turned down an invitation of George III's to become a physician to the King. Darwin's House in Lichfield, now a museum dedicated to his life and work. He was educated at Chesterfield Grammar School, then later at St John's College, Cambridge. He obtained his medical education at the University of Edinburgh Medical School. Whether Darwin ever obtained the formal degree of MD is not known. Darwin settled in 1756 as a physician at Nottingham, but met with little success and so moved the following year to Lichfield to try to establish a practice there. A few weeks after his arrival, using a novel course of treatment, he restored the health of a young man whose death seemed inevitable. This ensured his success in the new locale. Darwin was a highly successful physician for more than fifty years in the Midlands. George III invited him to be Royal Physician, but Darwin declined. In Lichfield, Darwin wrote "didactic poetry, developed his system of evolution, and invented amongst other things, a carriage steering mechanism, a manuscript copier and a speaking machine. Joseph Wright of Derby, Erasmus Darwin (1770; Birmingham Museum and Art Gallery). Darwin married twice and had 14 children, including two illegitimate daughters by an employee, and, possibly, at least one further illegitimate daughter. Susanna and Mary Jr later established a boarding school for girls. In 1782, Mary Sr (the governess) married Joseph Day (1745–1811), a Birmingham merchant, and moved away. Darwin may have fathered another child, this time with a married woman. A Lucy Swift gave birth in 1771 to a baby, also named Lucy, who was christened a daughter of her mother and William Swift, but there is reason to believe the father was really Darwin. Lucy Jr. married John Hardcastle in Derby in 1792 and their daughter, Mary, married Francis Boott, the physician. Henry Darwin (1789–1790), died in infancy. Darwin's personal appearance is described in unflattering detail in his Biographical Memoirs, printed by the Monthly Magazine in 1802. Darwin, the description reads, "was of middle stature, in person gross and corpulent; his features were coarse, and his countenance heavy; if not wholly void of animation, it certainly was by no means expressive. The print of him, from a painting of Mr. Wright, is a good likeness. In his gait and dress he was rather clumsy and slovenly, and frequently walked with his tongue hanging out of his mouth." Darwin died suddenly on 18 April 1802, weeks after having moved to Breadsall Priory, just north of Derby. The Monthly Magazine of 1802, in its Biographical Memoirs of the Late Dr. Darwin, reports that "during the last few years, Dr. Darwin was much subject to inflammation in his breast and lungs; he had a very serious attack of this disease in the course of the last Spring, from which, after repeated bleedings, by himself and a surgeon, he with great difficulty recovered." Darwin's death, the Biographical Memoirs continues, "is variously accounted for: it is supposed to have been caused by the cold fit of an inflammatory fever. Dr. Fox, of Derby, considers the disease which occasioned it to have been angina pectoris; but Dr. Garlicke, of the same place, thinks this opinion not sufficiently well founded. Whatever was the disease, it is not improbable, surely, that the fatal event was hastened by the violent fit of passion with which he was seized in the morning." His body is buried in All Saints Church, Breadsall. Erasmus Darwin is commemorated on one of the Moonstones, a series of monuments in Birmingham. Darwin formed 'A Botanical Society, at Lichfield' almost always incorrectly named as the Lichfield Botanical Society (despite the name, composed of only three men, Erasmus Darwin, Sir Brooke Boothby and Mr John Jackson, proctor of Lichfield Cathedral[notes 1]) to translate the works of the Swedish botanist Carl Linnaeus from Latin into English. This took seven years. The result was two publications: A System of Vegetables between 1783 and 1785, and The Families of Plants in 1787. In these volumes, Darwin coined many of the English names of plants that we use today. Darwin then wrote The Loves of the Plants, a long poem, which was a popular rendering of Linnaeus' works. Darwin also wrote Economy of Vegetation, and together the two were published as The Botanic Garden. Among other writers he influenced were Anna Seward and Maria Jacson. Erasmus Darwin also anticipated survival of the fittest in Zoönomia mainly when writing about the "three great objects of desire" for every organism: "lust, hunger, and security." A similar "survival of the fittest" view in Zoönomia is Erasmus' view on how a species "should" propagate itself. Erasmus' idea that "the strongest and most active animal should propagate the species, which should thence become improved". Today, this is called the theory of survival of the fittest. His grandson Charles Darwin, much less libidinous and who led more of an invalid life, and who is not known to have illegitimately fathered children, or fathered children he did not plan, acknowledge and raise, posited the different and fuller theory of natural selection. Charles' theory was that natural selection is the inheritance of changed genetic characteristics that are better adaptations to the environment; these are not necessarily based in "strength" and "activity", which themselves ironically can lead to the overpopulation that results in natural selection yielding nonsurvivors of genetic traits. Darwin's final long poem, The Temple of Nature was published posthumously in 1803. The poem was originally titled The Origin of Society. It is considered his best poetic work. It centres on his own conception of evolution. The poem traces the progression of life from micro-organisms to civilised society. The poem contains a passage that describes the struggle for existence. His poetry was admired by Wordsworth, although Coleridge was intensely critical, writing, "I absolutely nauseate Darwin's poem". It often made reference to his interests in science; for example botany and steam engines. The last two leaves of Darwin's A plan for the conduct of female education in boarding schools (1797) contain a book list, an apology for the work, and an advert for "Miss Parkers School". The work probably resulted from his liaison with Mary Parker. The school advertised on the last page is the one he set up in Ashbourne, Derbyshire for their two illegitimate children, Susanna and Mary. Darwin regretted that a good education had not been generally available to women in Britain in his time, and drew on the ideas of Locke, Rousseau, and Genlis in organising his thoughts. Addressing the education of middle class girls, Darwin argued that amorous romance novels were inappropriate and that they should seek simplicity in dress. He contends that young women should be educated in schools, rather than privately at home, and learn appropriate subjects. These subjects include physiognomy, physical exercise, botany, chemistry, mineralogy, and experimental philosophy. They should familiarise themselves with arts and manufactures through visits to sites like Coalbrookdale, and Wedgwood's potteries; they should learn how to handle money, and study modern languages. Darwin's educational philosophy took the view that men and women should have different, capabilities, skills, spheres, and interests, where the woman's education was designed to support and serve male agency, accomplishment and financial reward and relieve him from daily responsibility for children and chores of life. In the context of the times, this program may be read as a modernising influence in the sense that the woman was at least to learn about the "man's world", although not be allowed to participate in it. However, the text was written seven years after A Vindication of the Rights of Woman by Mary Wollstonecraft, which has the central argument that women should be educated in a rational manner to give them the opportunity to contribute to society. Some women of Darwin's era were receiving more substantial educations and participating in the broader world. An example is Susanna Wright, who was raised in Lancashire and became an American colonist associated with the Midlands Enlightenment. It is not known whether Darwin and Wright knew each other, although they definitely knew many people in common. Other women who received substantial educations and who participated in the broader world albeit sometimes anonymously, whom Darwin definitely knew, were Maria Jacson and Anna Seward. The Lunar Society: these dates indicate the year in which Darwin became friends with these people, who, in turn, became members of the Lunar Society. The Lunar Society existed from 1765 to 1813. Dr. William Withering, 1775, the death of Dr. Small left an opening for a physician in the group. Joseph Priestley, 1780, experimental chemist and discoverer of many substances. Samuel Galton, 1782, a Quaker gunmaker with a taste for science, took Darwin's place after Darwin moved to Derby. Darwin also established a lifelong friendship with Benjamin Franklin, who shared Darwin's support for the American and French revolutions. The Lunar Society was instrumental as an intellectual driving force behind England's Industrial Revolution. The members of the Lunar Society, and especially Darwin, opposed the slave trade. He attacked it in The Botanic Garden (1789–1791), and in The Loves of Plants (1789), The Economy of Vegetation (1791), and the Phytologia (1800). Mary Shelley in her introduction to the 1831 edition of Frankenstein notes that some unspecified "experiments of Dr. Darwin" were part of the evening discussion topics leading up to her inspiration and creation of her novel. Frail as your silken sisters of the field. A steering mechanism for his carriage, known today as the Ackermann linkage, that would be adopted by cars 130 years later (1759). A speaking machine, which was a mechanical larynx made of wood, silk, and leather and pronounced several sounds so well ‘as to deceive all who heard it unseen’(at Clifton in 1799). In notes dating to 1779, Darwin made a sketch of a simple hydrogen-oxygen rocket engine, with gas tanks connected by plumbing and pumps to an elongated combustion chamber and expansion nozzle, a concept not to be seen again until one century later. Erasmus Darwin, A Botanical Society at Lichfield. A System of Vegetables, according to their classes, orders... translated from the 13th edition of Linnaeus’ Systema Vegetabiliium. 2 vols., 1783, Lichfield, J. Jackson, for Leigh and Sotheby, London. Part I–III. 1796, London, J. Johnson. Charles Sheffield, an author noted largely for hard science fiction, wrote a number of stories featuring Darwin in a manner quite similar to Sherlock Holmes. These stories were collected in a book, The Amazing Dr. Darwin. Darwin's opposition to slavery in poetry was included by Benjamin Zephaniah in a reading. This inspired the establishment of the Genomic Dub Collective, whose album includes quotations from Erasmus "Ras" Darwin, his grandson Charles Darwin and Haile Selassie. The forgetting of Erasmus' designs for a rocket is a major plot point in Stephen Baxter's tale of alternate universes, Manifold: Origin. Phrases from Darwin's poem The Botanic Garden are used as chapter headings in The Pornographer of Vienna by Lewis Crofts. British poet J.H. Prynne took on the pseudonym Erasmus W. Darwin for his "plant time" bulletins in the pages of Bean News (1972). A building on the Nottingham Trent University Clifton Campus is named after him. It is the centre for science teaching, academic offices and study space. Erasmus Darwin appears as a character in Sergey Lukyanenko's novel New Watch as a Dark Other and a prophet living in Regent's Park Estate. Erasmus Darwin House, his home in Lichfield, is now a museum dedicated to Erasmus Darwin and his life's work. A school in nearby Chasetown recently converted to Academy status and is now known as Erasmus Darwin Academy. King-Hele, Desmond, ed. (2007). The collected letters of Erasmus Darwin. Cambridge: Cambridge Univ. Press. ISBN 9780521821568. Retrieved 7 March 2015. ^ Graves, Joseph L (2003). The Emperor's New Clothes: Biological Theories of Race at the Millennium. p. 57. ISBN 9780813533025. Retrieved 18 September 2011. ^ "Darwin, Erasmus (DRWN750E)". A Cambridge Alumni Database. University of Cambridge. ^ a b Uglow 2002b. ^ Zirkle, Conway (25 April 1941). "Natural Selection before the 'Origin of Species'". Proceedings of the American Philosophical Society. 84 (1): 71–123. ISSN 0003-049X. JSTOR 984852. ^ DNB entry for Erasmus Darwin. Oxford. ^ Darwin, Erasmus (1800). Phytologia, or the philosophy of agriculture and gardening (1st ed.). London: J. Johnson. p. 77. ^ Charles Mackay, ed. (1896). A Thousand and One Gems of English Poetry. Routledge. Britten, J; Boulger, GS (1889). "Biographical Index of British and Irish Botanists". Journal of Botany, British and Foreign. 27. Retrieved 7 March 2015. Carter, Philip (Spring 2013). "Shapers of the West Midlands Enlightenment" (PDF). West Midlands History Issue 1. pp. 13–16. Retrieved 12 March 2015. Desmond, Ray (1994) . Dictionary of British and Irish botanists and horticulturalists : including plant collectors, flower painters and garden designers (2 ed.). London: Taylor & Francis. ISBN 9780850668438. Retrieved 28 February 2015. King-Hele, Desmond. 1963. Doctor Darwin. Scribner's, N.Y.
King-Hele, Desmond. 1977. Doctor of Revolution: the life and genius of Erasmus Darwin. Faber, London. King-Hele, Desmond. 1999. Erasmus Darwin: a life of unequalled achievement Giles de la Mare Publishers. King-Hele, Desmond (ed) 2002. Charles Darwin's 'The Life of Erasmus Darwin' Cambridge University Press. Krause, Ernst 1879. Erasmus Darwin, with a preliminary notice by Charles Darwin. Murray, London. Pearson, Hesketh. 1930. Doctor Darwin. Dent, London. Porter, Roy, 1989. 'Erasmus Darwin: doctor of evolution?' in 'History, Humanity and Evolution: Essays for John C. Greene, ed. James R. Moore. Priestman, Martin (28 January 2014). The Poetry of Erasmus Darwin: Enlightened Spaces, Romantic Times. 2014: Ashgate. ISBN 9781472419569. Retrieved 12 March 2015. Smith, Christopher (2005). The Genius of Erasmus Darwin. Ashgate Publishing. p. 416. ISBN 9780754636717. Retrieved 12 March 2015. Uglow, Jenny (21 September 2002). "Sexing the plants". The Guardian. Retrieved 12 March 2015. Wikimedia Commons has media related to Erasmus Darwin.